It goes without saying that if you want privacy on your iOS devices, it’s your responsibility to set it up. Privacy is a huge deal, and without it, you might as well have Big Brother breathing down your neck 24 hours a day because your entire life can be on your smartphone or tablet – whether it’s your messages, GPS navigation, social networking, web searches, or otherwise. Getting started with privacy in iOS can be a little daunting, even intimidating, and that’s why we’re going to share with you at least 10 things you can do to better improve your overall privacy in iOS. Location Services are one of the most critical pieces of information that your device can take advantage of that can have the biggest impact on your privacy. Although location services come with many benefits, like GPS navigation, Apple Watch fitness features, Wi-Fi Calling, local weather information, and more, giving too many services access to your location means you never really know how those services are using your location and what they’re doing with your data. This is mostly the case with third-party services requesting your location because Apple is typically very transparent about how your information is used. When configuring apps that are allowed to use your location, use the “While Using” option as much as possible rather than “Always,” because this way the app can only use your location when you have the app open, and not in the background without your knowledge. Set apps that you don’t want using your location to “Never” so that your location is never shared with those services. 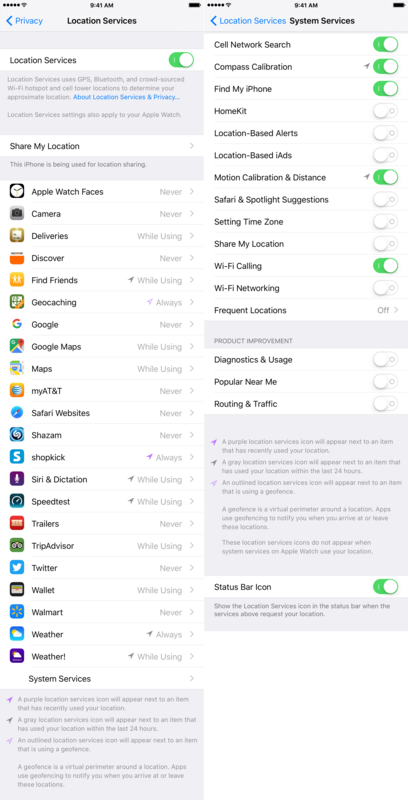 Allow necessary system services, but disable unwanted system services – things like Wi-Fi calling, motion calibration & fitness, compass calibration, and Find my iPhone are somewhat necessary, but frequent locations, share my location, and location-based iAds aren’t necessarily important, so turn off the non-important ones. Enable the Status Bar icon for when your location services are being accessed; this gives you a better understanding of when your location is being drawn, and you’ll be able to tell whether or not you’re doing something that needs your location when you see the icon and can investigate to see what’s doing it. Take note of learning the different icons: The solid purple one shows when an app has used your location recently, the solid gray one shows when an app has used your location in the last 24 hours, and the hollow purple one shows when an app is using a geofence – if something doesn’t look right, disable that app immediately. By fine-tuning these features, which may take multiple attempts of trial and error to get the best happy median between function and privacy, you can help block unwanted location tracking when you use your device for everyday activities. When it comes to web browsing, Safari is one of the biggest culprits of having your information snooped on when using an iOS device to browse the web. Many websites are coded to track their users and record the information they find. This might include the open tabs you have in your web browser, your login information, or even your location. Fortunately, Apple gives you a handful of useful options to protect yourself, such as private browsing mode, and some configurable settings for fine-tuning Safari’s privacy. Use private browsing mode whenever you don’t want your search history kept and you want your website tracking to be kept to a minimum. A darker Safari user interface is indicative of private browsing mode, as Safari’s UI is typically white. Limit tracking cookies so that your login information has to be entered manually and so that unwanted websites don’t track you. Turn off Safari Suggestions and frequently visited sites so that your web browser isn’t keeping track of the sites you visit regularly and sending the information to Apple for analysis. Block pop-ups and use content blockers responsibly so that potentially malicious pop-ups and ads from untrusted websites don’t compromise your privacy and security. Limit Safari’s permissions and access to system information and files, such as your location and Photo Library. This prevents unwanted information and file uploads. Use apps from the App Store instead of web apps as much as possible so that you can toggle off unnecessary Safari permissions. 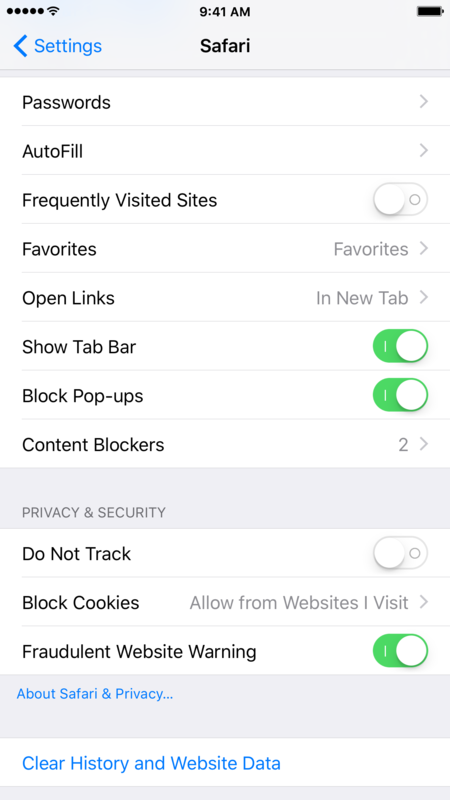 With a good blockade of settings configured in your Safari settings, you can keep yourself from being tracked and prevent private information about yourself, as ‘anonymous’ as it may be, from leaking into unwanted hands. Touch ID is one of the best tools ever to be built into an iPhone; with just your fingerprint, logging into your device and apps with a biometric footprint is fast and secure. Touch ID is used not only for unlocking your device, but also for purchases from the App Store, and depending on the developer of certain apps, such as Discover Mobile, PayPal,Screens VNC, Transmit, and many others, you can even use Touch ID to log into the specific applications themselves so you’re the only person capable of viewing their data. Your fingerprint is recorded securely into your iOS device as a mathematical expression and not as an image and is never uploaded to the internet, according to Apple. Moreover, your fingerprint is stored in a “Secure Enclave” as Apple calls it, meaning no other parts of your device’s hardware can access your fingerprint data, preventing hackers from reverse engineering your security information. 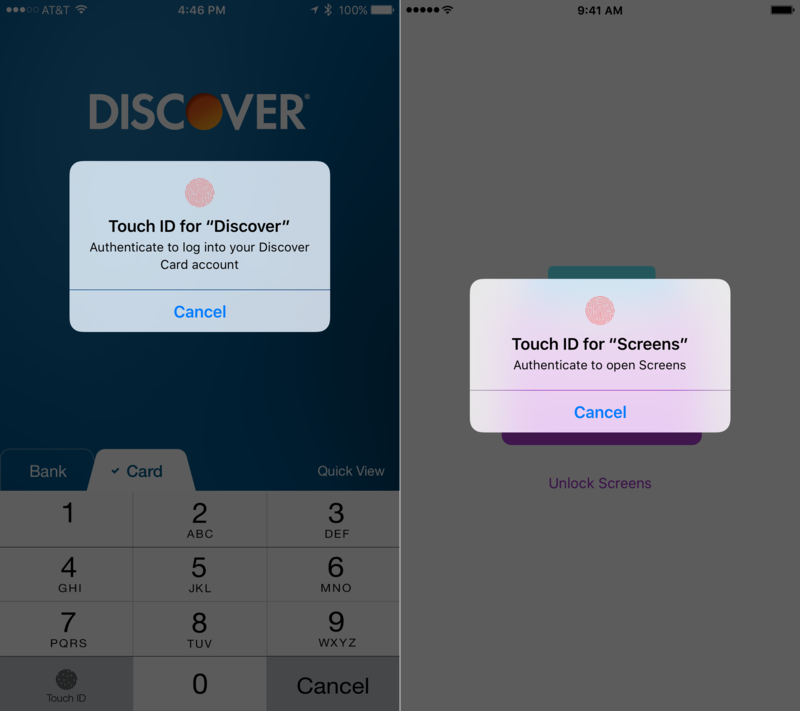 Enable Touch ID on capable devices for logging into your device. Not only is it secure, but it’s faster than entering a passcode, especially on the iPhone 6s and iPhone 6s Plus with the new sensor. Use Touch ID for App Store downloads and purchases – once again, this is much faster than entering a password, and you’re still secure by using it. Allow Touch ID whenever a third-party app offers to let you log in with it – not only is it faster than entering a password, but you are also using a secure platform and protecting potentially personal information that would otherwise be easily launched from the Home screen. Use the fewest number of fingers possible (max 2) when setting up Touch ID. Apple notes that there is a 1 in 50,000 chance that a small portion of someone’s fingerprint could match a small portion of one of yours, and by having fewer fingerprints registered, you reduce the chance one of those fingers is going to match. Touch ID is a modern security measure and we suggest wholeheartedly that you use it whenever possible. In the event that Touch ID ever acts up on you, read this tutorial for refreshing the feature and setting it up again. Some apps support ads, especially iAds, and Apple has a function built into iOS called ad tracking that allows iAds to show you only ads that are tailored to your specific interests. There’s really no clear-cut understanding of what kind of information Apple tracks to figure out what kind of iAds you’ll be shown based on your “interests,” so the best thing to do is keep iAds from being able to track you altogether so that your private information isn’t being shared with anyone. Step 1: Launch the Settings app and navigate to Privacy > Advertising. 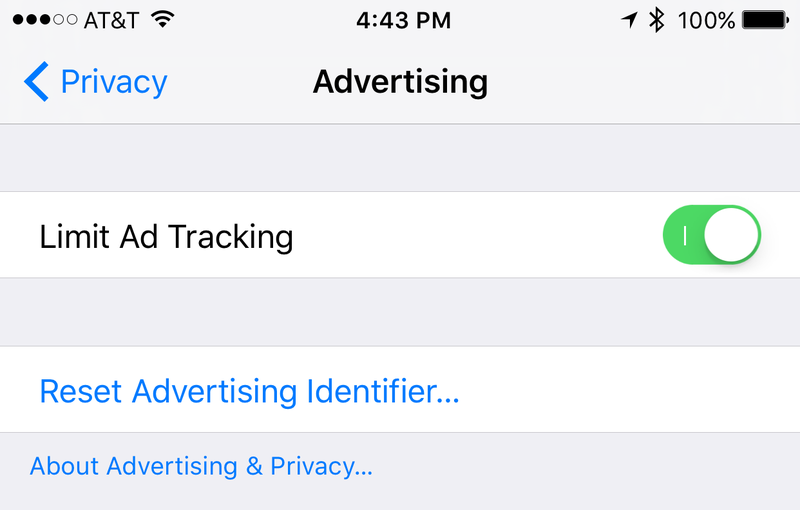 Step 2: Turn on “Limit Ad Tracking” and then tap on the “Reset Advertising Identifier…” button to clear the current information about you that has already been tracked. Now that your information isn’t being tracked for advertising, you might be able to sleep better at night, but there are still more privacy settings to configure before you’ll know your privacy is safe while you sleep at night. It may be annoying when you’re using your iPhone or iPad and suddenly your device’s display dims, or the device locks on you from inactivity, but this is actually both a security and privacy feature that is good to take advantage of because it prevents others from getting into your device when you leave it unlocked somewhere and going through all of your personal files, messages, social media, and more. 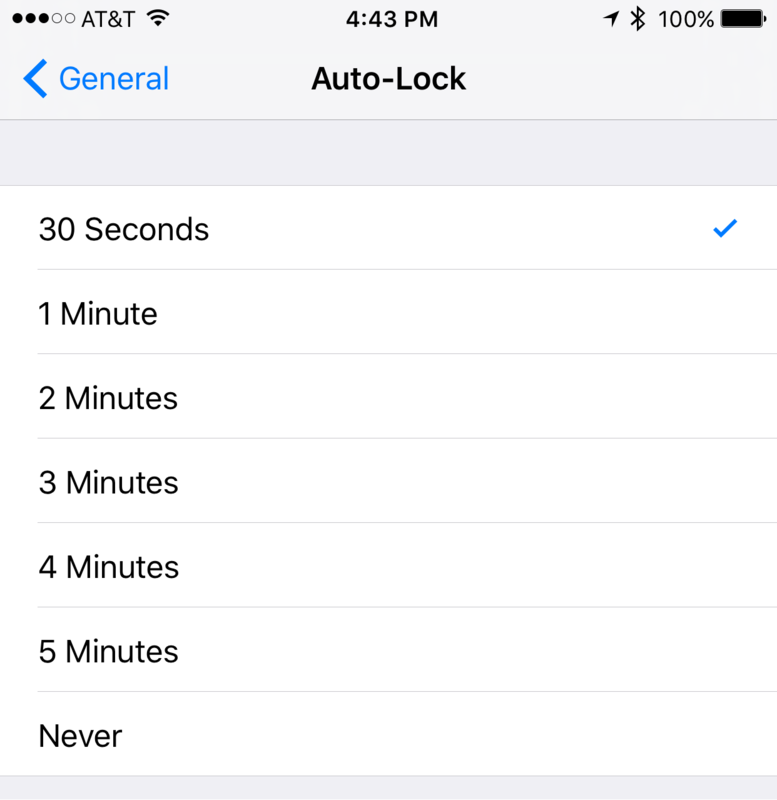 The auto-lock feature is accessed in the Settings app under Settings > General > Auto-Lock, and from here, you can choose after what time period your device will lock automatically to protect your personal information from nosy people who like to snoop. When you have Low Power Mode enabled, your device automatically defaults to 30 seconds for auto-lock and there’s no way to change it until Low Power mode is disabled. This is because having your display on consumes power and the whole point of saving power is to prevent power usage. If you’re not using Low Power mode, then you can choose the option you want. The default “1 Minute” option works very well for people that casually use their device for messaging, social media, web browsing, calling, and other usual features. We don’t ever recommend using the “Never” option, because then if you just happen to forget locking your device even just one time while it’s left somewhere or forgotten, your information is wide open to anyone that finds your device. Keep this setting short, sweet, and to the point; pro-longing auto-lock just gives someone with malicious intent more time to get to your device and snoop before it locks itself to protect your personal information. A VPN, or virtual private network, is used to tunnel all of your incoming and outgoing internet information to a remote server where someone with the intention of snooping on your internet activity would have a lot more trouble accomplishing the task than if you just left yourself wide open on an insecure public Wi-Fi network. 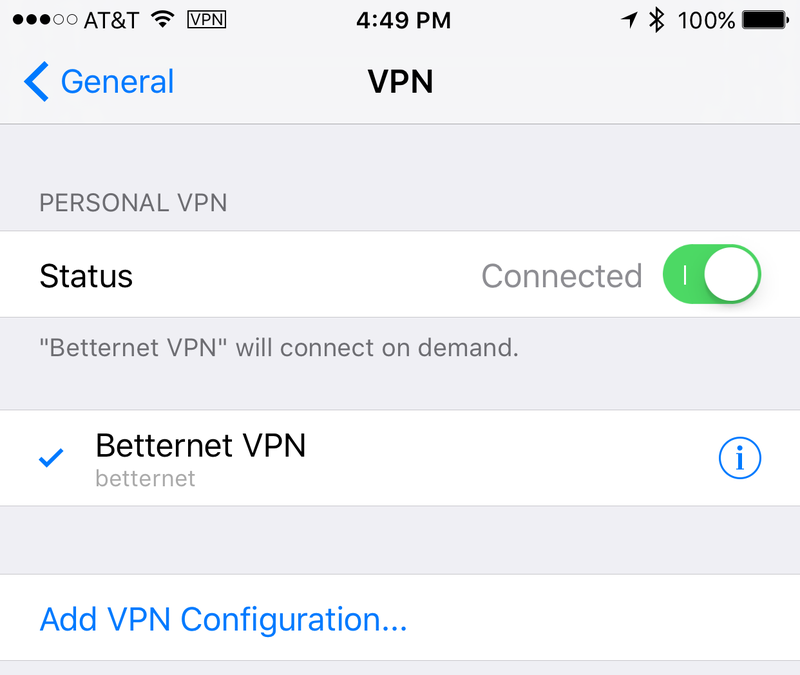 There are tons of free VPN services in the App Store you can download, such as betternetand TunnelBear, but you can also use paid VPNs or create your own VPN at home. Free VPNs typically collect anonymous data, hence why they’re free, but anonymous data might be better than allowing someone else on the same public Wi-Fi network to potentially steal important login information from right over the wireless network. Free VPNs may also throttle your speeds or impose data caps, but it’s still better than being snooped on. Paid or custom VPNs are typically more secure and offer higher speeds and unlimited data usage, so we recommend these services if you can afford them or have the knowledge to set one up from home. When you turn on a VPN, wait patiently until the “VPN” icon shows in the Status Bar. You are not browsing the web privately until you see this icon, otherwise your VPN may still be trying to connect. Avoid web browsing on public Wi-Fi networks until you actually see this icon to prevent insecure information from being sent or received. VPNs work over Wi-Fi and cellular networks, so experiment with what you want to use and keep your web browsing secure. If you ever need to remove one to install another one. 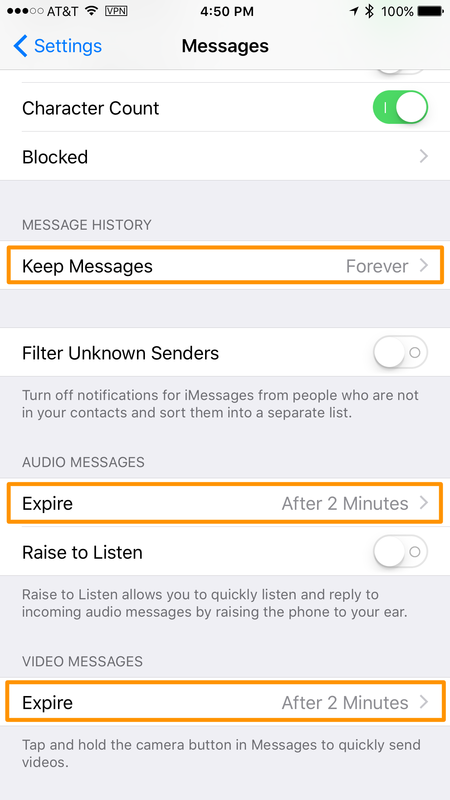 One of the really cool features of iOS 9 is how you can have your text messages, video messages, and audio messages in the Messages app expire automatically after a predetermined amount of time. Although this was originally implemented as a space-saving feature to prevent oldMessages app content from using up large amounts of storage space (especially on 16GB devices), it can also be used as a privacy feature by regularly cleaning out your messaging history. From the Settings app, you can go to the Messages preferences pane, shown above, and you’ll find individual sections for text messages, audio messages, and video messages. Audio messages and video messages only give you the option of expiring after 2 minutes or 30 minutes – no matter what, they’re going to expire and eventually be removed from your device, but if you’re a privacy freak, you’ll want to choose 2 minutes so that after you watch/hear the content they’ll be removed from your chat history. Text messages can be set to expire after 30 days, one year, or never – if you care about your privacy and your storage space, you might select 30 days, but if you want to keep a paper trail of the conversation history to reference later on, auto-deleting messages may not be for you. Tread carefully. When something “expires,” it is removed from that device; forever. You can’t get it back. You can, however, save media you receive before it expires, such as video files that you receive in the Messages app that you want to save to your Camera Roll. By keeping your messaging history flushed every so often, you will prevent anyone who gets into your device from being able to read all of your messages and see the media that you swap between friends, families, and co-workers. Apple wants your valuable personal information to help improve their products. This means telling Apple every time you have an error message or something moves too slowly for Apple’s tastes, and this also means giving Apple a snapshot of everything you were doing at the time of the problem, and perhaps even where you were in cases where diagnostic information is collected in the Maps app. 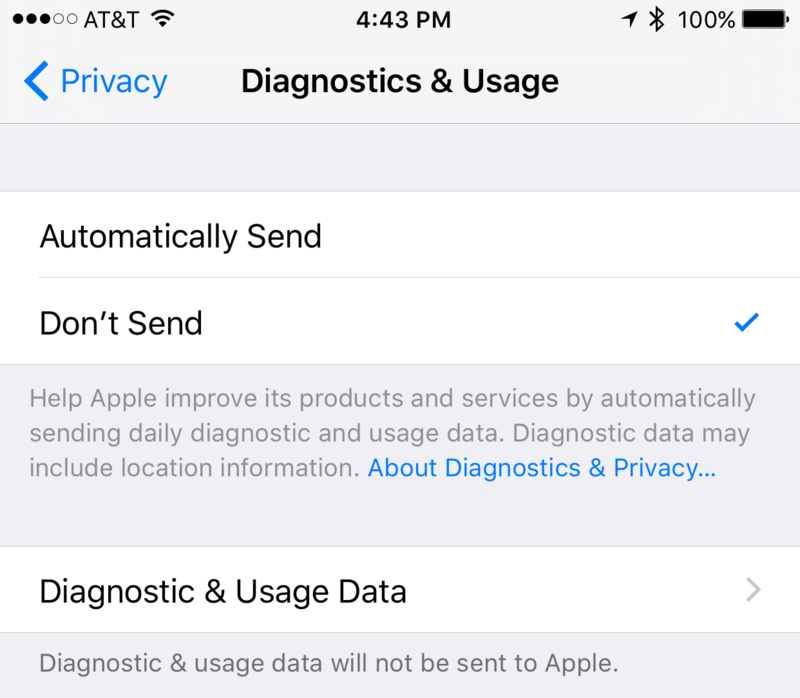 Under Settings > Privacy > Diagnostics & Usage, you can view whether or not you’re sharing your diagnostic data with Apple. When you set up your iOS device for the first time, you’re asked whether or not you want to share data, and if you choose yes, “Automatically Send” will be enabled here. If you don’t want Apple snooping on your device usage, even if it is for the greater good, you can choose “Don’t Send” from this menu and Apple will stop collecting anonymous usage information from you. Apple says location may be used in diagnostic information for a variety of purposes, one being determining how strong a cellular signal is in a particular location. On the other hand, no personally identifiable information is included in the data logs because it’s “removed before they’re sent to Apple,” which raises the eyebrow of who is doing the removing and whether or not they could be snooping. For this reason, I always just turn this feature off. My device works good enough and there’s really no reason for me to be sending off diagnostic information that could blow my privacy. When Photo Stream first came out, there were a lot of complaints about people’s personal and private photos and videos being uploaded to a remote server. Apple’s intentions, which were clearly to tie all media across all your devices, were not very well thought out when the feature first came out. Fortunately, they’ve since fixed things up a bit, giving users an ability to delete Photo Stream content. Still, there’s something a little uncomfortable about having all your personal photos, memories, and yes, even the occasional scantily clad image shared on the internet without your permission. For this reason, if you value your privacy, you may want to consider disabling Photo Stream and iCloud Photo Library from your device’s Photo settings to keep your media where it belongs – off of the internet. You can launch the Settings app and open the Photos & Camera settings to find toggle switches for My Photo Stream and iCloud Photo Library. I always turn these off because I have a phobia of automatic uploads, but everyone has their own reasons. 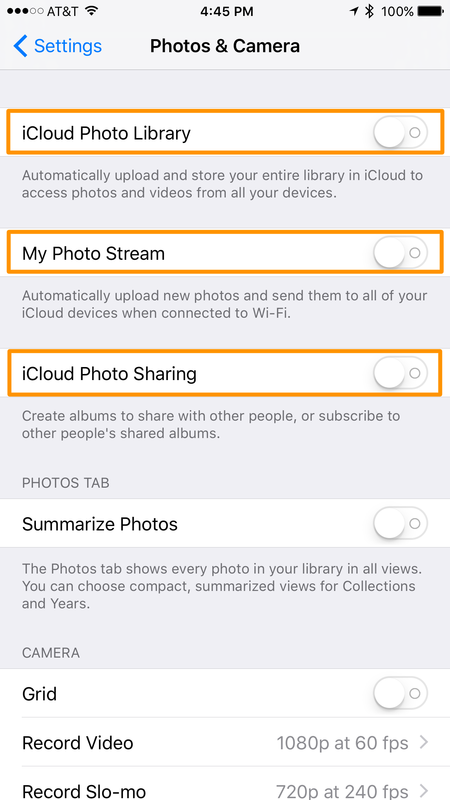 I even go a step further and disable iCloud Photo Sharing because I’m personally not a fan of the feature. By turning off all these features, you keep your photos and videos that you take or save from being automatically uploaded to the internet to your iCloud account. With all of the recent iCloud hack scares, you’re just far better off unlinking your media from your iCloud account and leave iCloud for backups, music, and other types of information. Not only does this keep your photos and videos off the internet, but it also keeps these photos and videos off of your other iOS devices and Macs, which may or may not be password or passcode protected like your main one is. In this case, it prevents a possible exploit in security too. iOS shows all your notifications on the Lock screen, as well as Notification Center, but the Lock screen is different because no form of security is needed to get there. This means that the content of your text messages and emails will display freely on the Lock screen, giving even someone who doesn’t know your passcode the ability to snoop. Fortunately, iOScomes with a way to prevent this. 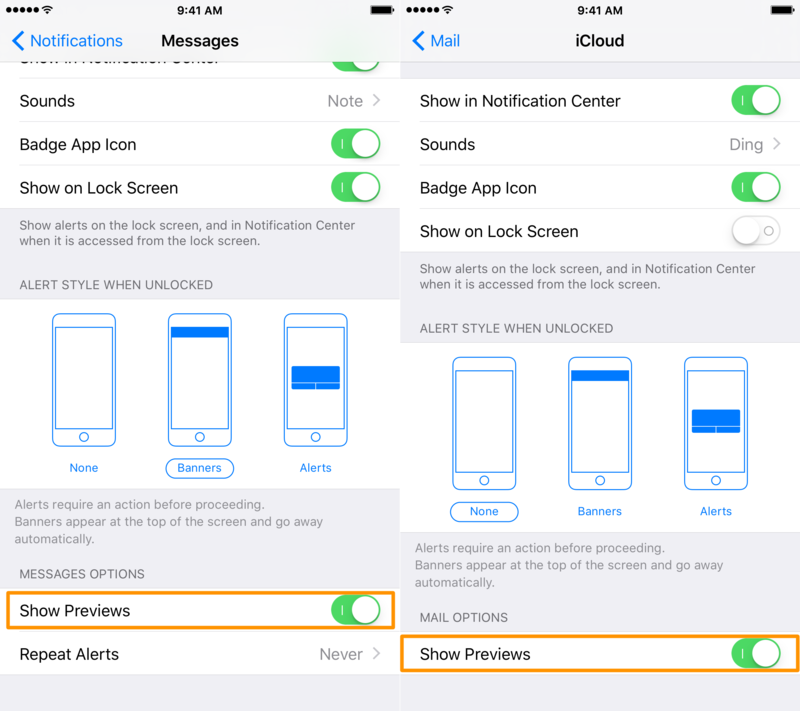 For text messages and iMessages, you will want to go to Settings > Notifications > Messages, and for emails, you will want to go to Settings > Notifications > (email account). In these preference panes, you’ll find a setting called “Show Previews.” This option lets you hide content from the Lock screen while still allowing iOS to alert you that there’s a notification you need to read. For example, instead of a text message notification son your Lock screen saying, “Anthony Bouchard: Hey how are you?,” the notification would now say “New Message from Anthony Bouchard,” which as you can see, hides the content of the message, but still lets you know there’s a message you need to look at. Since the feature can be enabled for both the Messages and Mail apps, you’re covered pretty well on both fronts. Anyone serious about the privacy of their texts and emails should highly consider disabling the Show Previews option. With privacy and security working together to give you a sense of immunity from judgement and information theft, taking into account all of these different settings and features of your iOS devices is never something that should be taken lightly. Apple takes a lot of pride in the security of their devices, but the features are only useful if you take advantage of them. Next Worst Passwords: Does Yours Make The List?